I don’t know about you, but the onset of spring and summer always makes me crave simple meals that let me focus on the deliciousness of fresh, seasonal veggies. In Madison, there are ample opportunities to purchase just such produce. Two of our farmers’ markets opened this past weekend, including the one I most often attend: the West Side Community Market. Although it’s nowhere near as large or happenin’ as the Dane County Farmers’ Market (it’s difficult to outshine the largest farmers’ market in the country, one that surrounds Madison’s gorgeous capitol building! ), I love the west side market because it’s nowhere near as crowded and it’s closer to where I live. So S and I made a point of stopping by this past Saturday, where we picked up a modest selection of produce, including two big, beautiful golden tomatoes. When it came time to make dinner, I knew I wanted something simple that would let us savor the tomatoes, not drown them in sauce or hide them in a jumble of other flavors and ingredients. So I sauteed lots of garlic and a dash of red pepper flakes in a bit of olive oil, cooked up some whole-wheat fettuccine, chopped up one of the tomatoes, and then tossed the tomatoes and pasta in the warm, garlic-infused oil and topped it all with some freshly ground black pepper. With a simple side salad, it was the perfect way to celebrate spring and its bounty of fresh produce. I am excited for the farmers’ market season too!! I have been to the Dane County one you mentioned. I visited my friend in Madison last summer and she lives a mere three blocks from it. Goodness, it was crowded, but my oh my, they had the best selection of produce (I was particularly fond of the yellow string beans!). Your meal looks simple and delicious! The crowdedness is my main reason for preferring the smaller one, but the variety can’t be beat! I like going with family and friends when they visit. Just a simple salad of arugula, cucumber, avocado, radishes, green apple with a sprinke of hemp seeds and walnuts! Also just shredded cucumber with some truffle oil. Yum!! You had me at arugula! Love the simple meals… My friends and I just recently had a small reunion dinner celebrating a summer we shared in Italy. While there, we saved money by having “family dinners”. 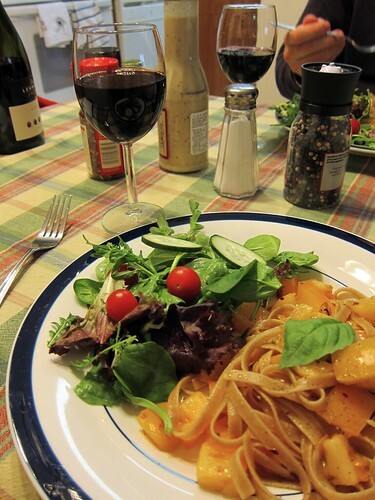 One of our friends can replicate the local tomato sauce, we would cook the Strangozzi (a rope-like pasta), and another friend would make a salad of some sort, often with chickpeas, zucchini, and tomatoes. These, plus bread, olive oil, and local wine, made for amazing, cheap meals. Somehow, those simple meals tasted the best and made for the fondest memories. Thanks for sharing! Oh wow, that sounds so delightful! I adore those simple, Italian-inspired meals. When I was in Florence a few months ago, the absolute best meal I ate there was just spaghetti tossed with tomatoes and super garlicky olive oil (hmm, not unlike the meal I blogged about!). It was just heavenly.